What's that nagging cough, and what can you do to cure it? Cough for a minute or two, and you may think something has "gone down the wrong pipe." Cough for a day or two, and you may think you've picked up a cold or the flu. After a week, bronchitis or allergies may come to mind. But after three or four weeks, your mind starts to race, and the worry begins to mount. For many people, chronic coughing raises the specter of cancer. But is cancer really a common cause of a cough that lingers? And if it's not, what is — and what can you do to quiet a nagging cough? Although folk wisdom views coughing as a grave portent of illness — What did one casket say to the other? "I hear you coffin" — the cough is actually a vital player in the body's defense against disease. Coughing expels mucus, microbes, and foreign particles from the respiratory tract, protecting the lungs from infection and inflammation. The cough begins with an initial gasp that draws air deep into the lungs. Next, the glottis snaps shut, putting a lid over the trachea, or windpipe. The third step is the forceful contraction of the muscles of the chest cage, abdomen, and diaphragm (see figure). In normal breathing, these muscles push air gently from the lungs up through the nose and mouth. But when the glottis is closed, the air can't move out, so tremendous pressure builds up in the air passages. Finally, the glottis swings open and the air rushes out. And it is quite a rush; in a vigorous cough, the air travels out at nearly the speed of sound, creating the barking or whooping noise that we call a cough. A cough can be a conscious, voluntary act or an uncontrollable, involuntary reflex. In the latter case, stimulation of nerves in the larynx ("voice box") and respiratory tract initiates the entire process. These nerves can be irritated by infections, allergies, cold air, tumors, chemical agents such as smoke, mechanical factors such as dust particles, or by normal body fluids such as nasal mucus or stomach acid. It's no wonder, then, that so many different things can trigger a cough. Everyone coughs, and nobody worries about an occasional cough. Many acute illnesses — ranging from hay fever and the common cold to bronchitis and pneumonia — produce recurrent coughs. But the cough that accompanies acute illnesses resolves in a matter of a few days to a few weeks. In contrast, a chronic cough is variously defined as one that lingers for more than three to eight weeks, sometimes lasting for months or even years. Chronic coughing is common, so frequent that it rates as one of the most common reasons for seeing a doctor. In addition to worry about the cause of the cough, patients experience frustration and anxiety, especially if diagnosis and treatment stretches out over weeks, which is often the case. Coughing interrupts sleep, producing fatigue and impairing concentration and work performance. In this age of scary new viruses, social interactions may suffer. And coughing can also have important physical consequences, ranging from urinary incontinence to fainting and broken ribs. Between medical tests, lost productivity at work, remedies that don't help, and treatments that do, coughing can become expensive. Smoking is a leading cause. Sooner or later, most cigarette smokers develop a chronic "smoker's cough." Chemical irritation is responsible — but the same noxious chemicals that cause the simple smoker's cough can lead to far more serious conditions, such as bronchitis, emphysema, pneumonia, and lung cancer. The chronic cough is always a cause of concern for smokers. A lingering cough is also a worry for nonsmokers. Fortunately, benign problems are responsible for most chronic coughs in nonsmokers. Benign or not, persistent coughing can cause worry, embarrassment, exhaustion, and more. That's why chronic coughs should be diagnosed and treated before they linger too long. Dozens of conditions can cause a recurrent, lingering cough, but the lion's share are caused by just five: postnasal drip, asthma, gastroesophageal reflux disease (GERD), chronic bronchitis, and treatment with ACE inhibitors, used for high blood pressure. Many people have several of these conditions, but in nonsmokers, the first three, singly or in combination, account for nearly all chronic coughs. The major causes of long-term coughing are listed below. 1. Postnasal drip (also called the upper airway cough syndrome). The human nose is more than the organ of smell. It is also the gateway to the lower respiratory tract. As such, its job is to condition the air passing through en route to the lungs. The nose warms air that is cool, adds moisture to air that is dry, and removes particles from air that is dirty. The nasal membranes accomplish all three tasks by producing mucus that is warm, moist, and sticky. Although the nose is a guardian of the more delicate lungs, it is subject to problems of its own. Viruses, allergies, sinusitis, dust particles, and airborne chemicals can all irritate the nasal membranes. The membranes respond to injury by producing more mucus — and unlike normal mucus, it's thin, watery, and runny. All that mucus has to go somewhere. When it drips out the nose, it's a nuisance. But when it drips down the throat, it tickles the nerves of the nasopharynx, triggering a cough. In some cases, the nose itself is to blame (rhinitis), but in others, a prolonged postnasal drip lingers after a viral upper respiratory infection; some call this variety a post-infectious cough. In typical cases, patients with postnasal drip cough more at night, and they are often aware of a tickling feeling at the back of their throats. But they can cough during the day, and their throats may be irritated and sore or perfectly fine. The best way to find out if a chronic cough is the result of postnasal drip is to try treatment. Nonprescription decongestant or antihistamine tablets are the first step. Most contain a decongestant, an antihistamine, or a combination of the two. In one form or another, these medications are generally effective and safe, but some people complain of a racing heart and souped-up feeling (due to the decongestant), while others feel sleepy (due to the antihistamine). Men with benign prostatic hyperplasia (BPH) may have difficulty passing urine while they're taking decongestants, and antihistamines can occasionally trigger acute glaucoma. As with all medications, read the directions carefully. Home remedies can help as well. Inhaling steam from a hot shower or kettle is the simplest. Nasal irrigations may also help by cleaning out irritating secretions. You can purchase saline nose sprays at your drugstore or you can do it yourself. First, soak a clean washcloth in a basin containing ⅛ teaspoon of table salt for each cup of water. Next, hold the dripping wet cloth up to your nostrils and sniff in the saline solution. If saline irrigations seem to help, repeat them one to three times per day. Postnasal drip is the leading cause of the lingering cough. But it's far from the only cause. 2. Asthma. 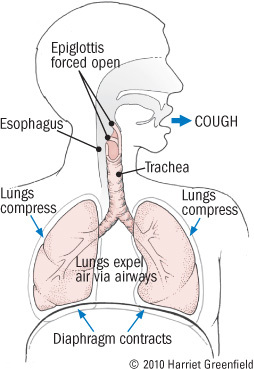 Wheezing and breathlessness are the usual symptoms of asthma. But not all patients with asthma wheeze. Indeed, some just cough. Asthma results from bronchospasm, the temporary, reversible narrowing of the medium-sized tubes that carry air into the lungs. In most cases, that air makes a whistling or wheezing sound as it moves through narrowed passages. Excessive mucus production, shortness of breath, and cough are the other classic symptoms of asthma. But in cough-variant asthma, coughing is the only symptom. In most cases, cough-variant asthma produces a persistent, dry cough that occurs around the clock but may begin at night. 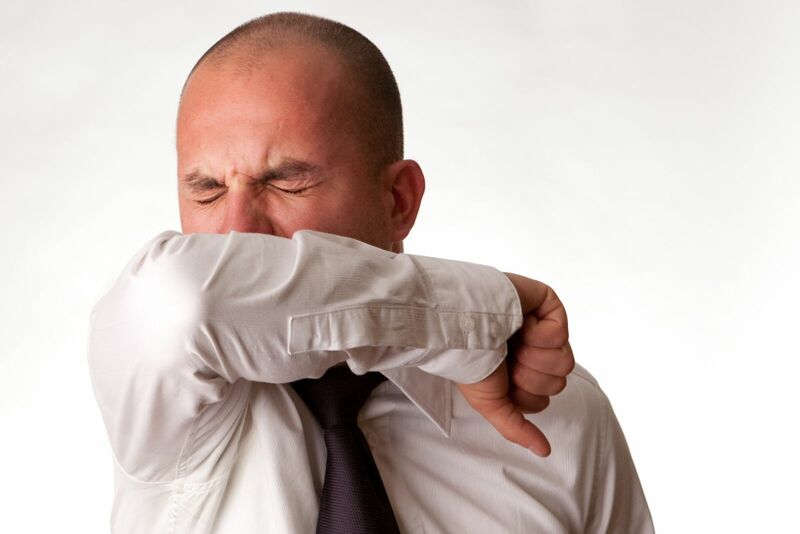 Exposure to allergens, dust, or cold air often triggers coughing, as does exercise. If doctors suspect that asthma is responsible for a chronic cough, they can order pulmonary function tests to confirm the diagnosis; if these tests are inconclusive, patients may be asked to inhale small doses of methacholine, a drug that often triggers wheezing in asthmatics. Another approach to the diagnosis of cough-variant asthma is to see if the cough responds to anti-asthmatic treatment. Doctors often suggest a bronchodilator spray such as albuterol (Proventil, Ventolin). It's short acting. So, in addition your doctor might prescribe an inhaled cortico steroid, such as fluticasone (Flovent), triamcinolone (Azmacort) or budesonide (Pulmicort). If you have a chronic cough that may be due to asthma, ask your doctor to consider testing or treating. But if asthma is not the answer, ask him to think about the third leading cause of the cough that lingers. 3. Gastroesophageal reflux disease. Just as people are surprised to learn that asthma can cause coughing without wheezing; many people are shocked to learn that gastroesophageal reflux disease (GERD) can cause coughing without heartburn. GERD occurs when stomach contents travel upstream, making their way up into the esophagus instead of down into the intestines. Heartburn is the usual symptom; belching, a sour taste in the mouth, and bad breath are common too. But acid also irritates nerves in the lower esophagus, and these nerves can trigger the cough reflex even without the distress signal of pain. In fact, up to one-third of patients with GERD are pain-free, complaining instead of cough, recurrent laryngitis, or unexplained sore throats. GERD can be tricky to diagnose when there's no pain. Barium swallow x-rays and esophagoscopy can help, but the gold standard is esophageal pH monitoring, in which the patient swallows a probe that remains in the lower esophagus for 24 hours to detect the presence of acid. It's not as uncomfortable as it sounds, but it is expensive and inconvenient. As with the other causes of chronic cough, a simpler approach to diagnosis is to try treatment. You can begin on your own. Avoid alcohol and foods that often trigger GERD, including those that contain chocolate, peppermint, caffeine, garlic, onions, citrus fruits, tomato sauce, or lots of fat. Eat small meals, and never lie down until two hours after you've eaten. Take liquid antacids, particularly at bedtime, and consider elevating the head of your bed or sleeping on a wedge-shaped pillow to keep your stomach's contents flowing down at night. If you're constantly coughing after a week or so, you can add an over-the-counter acid suppressor. Today there are many to choose from, including ranitidine (Zantac), cimetidine (Tagamet), famotidine (Pepcid), omeprazole (Prilosec) and lansoprazole (Prevacid). Stronger versions are available by prescription. It may take three or four weeks of gradually escalating therapy to control GERD. But if your program doesn't work, you are probably coughing for some other reason. 4. Chronic bronchitis and bronchiectasis. Chronic bronchitis is persistent inflammation of the bronchial tubes causing airway narrowing and production of excess mucus. It usually happens from tobacco use or long-term exposure to high levels of industrial air pollutants. Bronchiectasis is also a result of chronic inflammation that damages the walls of the bronchial tubes. In either variant, the inflammation leads to a chronic cough. The most effective treatment is to quit smoking and avoid air pollutants. In addition, your doctor can prescribe a corticosteroid inhaler, usually with a long-acting bronchodilator. People with chronic bronchitis are prone to flare-ups. Doctors call them COPD exacerbations. The main symptoms are increased coughing, thick dark mucus production, shortness of breath, and fatigue. The treatment includes antibiotics and an oral corticosteroid, usually prednisone. 5. Therapy with angiotensin-converting–enzyme (ACE) inhibitors. ACE inhibitors such as enalapril (Vasotec, generic), lisinopril (Prinivil, Zestril, generic), as well as many others, have assumed a prominent role in the treatment of high blood pressure and heart failure. ACE inhibitors are favored by many doctors because they produce good results and have few side effects, with one exception -- a persistent cough. It occurs in up to 20% of people taking an ACE inhibitor. The first symptom is often just a throat tickle, followed by a dry cough that can begin as soon as three weeks or as late as one year after the medication is started. Once the cough starts, it lingers and lingers. If the cough is mild, patients may choose to continue their medication, or they may cough less if they change to a different ACE inhibitor. But the only way to eliminate a severe cough induced by an ACE inhibitor is to switch to another type of antihypertensive medication. Fortunately, many are available, including angiotensin-receptor blockers (ARBs) like losartan (Cozaar) and valsartan (Diovan) — drugs that act like ACE inhibitors without causing a cough. In nonsmokers, the Big Five account for more than nine of every 10 chronic coughs. But other problems can — and do — cause lingering coughs. Lung infections make people cough. Most cases of pneumonia are acute infections requiring rapid diagnosis and treatment. However, some lung infections can be more indolent and can cause a persistent cough. Fever is an important clue to infectious causes of persistent coughing. Pertussis (whooping cough) is a respiratory tract infection that can cause serious problems in children who have not been immunized properly with diphtheria-pertussis-tetanus (DPT) vaccine. Pertussis began to resurface in adolescents and adults because the original tetanus-diphtheria booster shots did not cover pertussis and the vaccine's effectiveness wears off over time. Heart disease can masquerade as lung disease if coughing and breathlessness are its main symptoms. It's a common occurrence in patients with heart failure (HF). Their cough is most pronounced when they're lying flat, so they often resort to sleeping propped up on pillows. The cough of HF may be dry, or it may produce thin, frothy white sputum. Leg swelling, fatigue, and exercise intolerance are other common symptoms of HF. Abnormal swallowing can lead to persistent coughing if food triggers the cough reflex by heading down the "windpipe" instead of the "food pipe." Called aspiration, the problem occurs mainly in people with strokes or other neurologic disorders that hamper normal swallowing. Environmental irritants can trigger the cough reflex, not just once but with nearly every breath of air laden with chemicals or particles ranging from sulfur dioxide to nitric oxide to dust and molds. Even clean air can trigger coughing if it is too dry or too cold. Lung cancer certainly belongs on the list of disorders that cause persistent coughing. Fortunately, though, it's not high on the list, at least in nonsmokers. Stress. Mental factors can produce many physical symptoms, including cough. Psychogenic coughing increases at times of stress and disappears during sleep. If you don't think that coughing is a common complaint, just head to the nearest drugstore. You'll find a bewildering array of syrups, sprays, tablets, and lozenges designed to control coughing. You'll also see a steady stream of customers coughing up lots of money to purchase products that may be ineffective. Many cough remedies contain expectorants, compounds intended to loosen sputum, making it easier to clear. Guaifenesin is the most popular expectorant. Unfortunately, there is little scientific evidence that expectorants are effective. You'll probably do just as well by using a humidifier and drinking lots of water. Cough suppressants are also very popular. Nonprescription agents such as dextromethorphan can partially suppress the cough reflex, promoting patient comfort. Prescription cough syrups with codeine tend to be more effective. When used appropriately, cough suppressants can reduce discomfort; remember, though, that because coughing can serve a useful function, it should not always be suppressed. Medicated lozenges and cough drops are among the most widely sold cough remedies. These products contain various combinations of menthol, camphor, eucalyptus oil, honey, and other ingredients. Like with liquid cough medicines, some also contain topical anesthetics. Despite their popularity, there is no evidence that medicated cough drops are more effective than simple hard candies. Don't ignore a chronic cough — but don't panic just because your cough lingers for more than three or four weeks. Most often, the puzzle can be solved without elaborate tests, and the problem can be corrected with simple treatments. In fact, you may be able to diagnose and treat yourself, especially if postnasal drip or gastroesophageal reflux is the culprit. Even so, your doctor can also help. In most cases, it won't take much more than a stethoscope and a treatment trial or two. But if your cough is accompanied by sputum production, bloody sputum, fever, weight loss, night sweats, breathlessness, undue fatigue, or chest pain, you should consult your doctor without delay.